This collection makes available study scores for Tchaikovksy's extensive output for orchestral (excluding Ballets). This collection makes available study scores for Mozart's major works for orchestra and solo instruments with orchestra (excluding piano concertos). This collection makes available study scores for Brahms's major orchestral works. 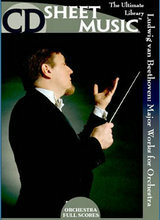 This collection makes available study scores for Beethoven's major orchestral works. This collection makes available study scores for J.S. Bach's major orchestral works.